Traditional Italian menus have five sections. A full meal usually consists of an appetizer, first course and a second course with a side dish. It's not necessary to order from every course, but usually people order at least two courses. Traditional meals may last one or two hours or even longer. 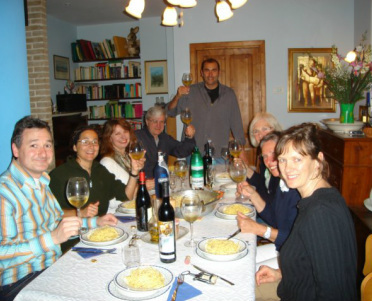 Italians often go out for a long Sunday lunch with their families and restaurants will be lively. It's a good chance to experience Italian culture. Aperitivo: a small dose of liqueur enjoyed before the meal, like Prosecco or Campari. The antipasto: A traditional Italian meal starts with something to nibble on, called an antipasto, which translates into English as “before the meal.” Can include hot and cold appetizers like cheese, sopprasatta, bread, and dressed vegetables. The primo: In Italy, pasta is a first course, or primo, served as an appetizer, not as the main event. Soup, rice, and polenta are the other options for the primo. The secondo: The main course is called il secondo, or the second course. Chicken, meat, or fish are the usual choices, and portions are generally small. These main courses are usually fairly simple, especially if a rich pasta or rice dish precedes them. The contorno: A platter of vegetables usually accompanies the main course. This side dish highlights the simple goodness of the vegetable. The dolce: A dolce (or sweet) ends a traditional Italian meal. Caffe: coffee and its permutations. A must with the dolce. Digestivo: a “digestive” or after dinner liqueur like grappa and limoncello.